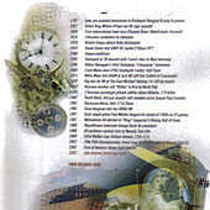 Offers a chronological timeline of important dates, events, and milestones in Vermont history. From 7000-1000 BCE, Native Americans reside in Vermont, moving around the region seasonally to hunt, gather, and fish. And from 1000 -1600 CE, the Woodland period, Native Americans establish villages and develop trade networks and ceramic and bow-and-arrow technology. The earliest known Native American farm site in Vermont is an Abenaki settlement in Springfield, dating from around 1100 CE. The Algonquian and the Iroquois also inhabit the region that becomes Vermont. The Native population in Vermont is nearly wiped out over the next two centuries due to European diseases and a desire for land among European settlers. Vermont was initially settled in the early 18th century by both the British and French, and conflicts between the two nations continued until the French defeat in the French and Indian War, after which the land was ceded to England. During the American Revolution, Vermont declared independence separately from the original 13 colonies, although the Continental Congress refused to recognize it. 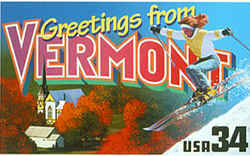 Vermont was finally admitted to the union as the 14th state in 1790. 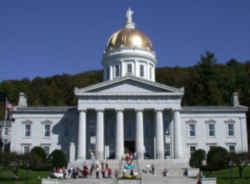 1786 - The Vermont Legislature passes "An Act to Prevent the Sale and Transportation of Negroes and Malattoes Out of This State." "Slavery is incompatible with the vital principles of all free governments and tends to their ruin. It paralyzes industry, the greatest source of national wealth, stifles the love of freedom, and endangers the safety of the nation. It is prohibited by the laws of nature which are equally binding on governments and individuals. The right to introduce and establish slavery in a free government does not exist."